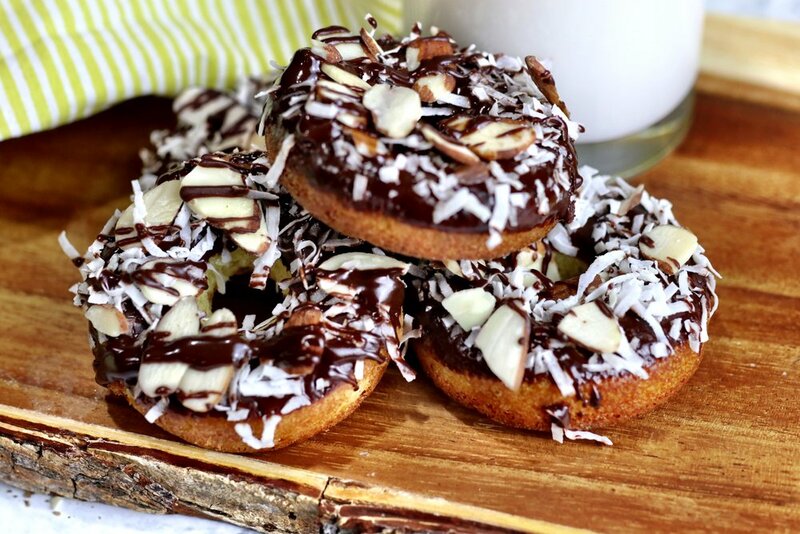 Almond Joy DonutsðŸ�©!! What better way to start your morning then a cup of tea and a nice chocolatey donut?! Seriously they are so good that they are almost guaranteed to help boost your morning moodðŸ˜†. And bonus- no long drive through line or crazy amounts of sugar to have one of these bad boys! I choose to make mini donuts so I get 2(one for each hand just like my toddler likes itðŸ˜‚). 3. Using a hand mixer and a medium bowl, blend the butter, cream and sweetener until smooth. 4. Add the eggs and vanilla and almond extract and blend until combined. Next add the almond flour and baking powder and mix well. 5. Spoon the dough into a well-greased donut pan (if you donâ€™t have one you can make them in a cupcake/muffin pan). 7. In a small shallow bowl mix the glaze ingredients and microwave for 30 seconds until chocolate is smooth(you may need an extra 15-30 seconds). Add almond milk if you want a thinner glaze. Then dip the top of the donuts in the chocolate. Sprinkle coconut flakes and sliced almonds over the top. You may need to microwave the chocolate 15 seconds if it starts hardening so you can keep dipping. Drizzle any remaining chocolate over the top of the donuts.